The Albany Visitors Association 2018 – 2019 free visitor guides are now available. What makes our publication a bit different than others you might pick-up on your travels? For one, our magazine-style articles delve into fun tidbits about Albany and surrounding Linn County. 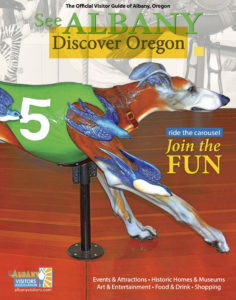 This year, local journalist Jennifer Moody dives into a profile about Neal the Greyhound, one of the Albany Historic Carousel & Museum’s hand-crafted animals. The story of Neal illustrates the magic and artistry of the carousel and how it both enthralls and attracts visitors. The new guide also highlights Albany’s history and heritage, with information about the four historic districts, century-old homes and buildings, and the people who founded our city in the late 1840s. Interested in the arts and what’s happening around town? Take a few minutes to read about Albany’s artist cooperative Gallery Calapooia as well as year-round events and outdoor recreation. 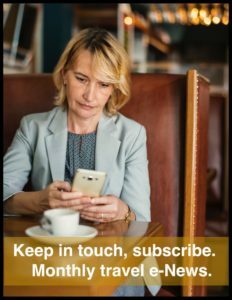 AVA provides the colorful publication at no charge. Telephone 541-928-0911 and request a copy to be mailed or stop by the office and grab one at 110 3rd Ave SE (corner of 3rd and Lyon), between 9:00 a.m. to 5:00 p.m., Monday through Friday. You can also view the online version by following the link below. View the flip version of the guide. Please send us an Albany Visitors Guide. If you want to view a digital copy, please go to albanyvisitors.com. If you would like me to mail you a hard copy, please send me your address.